July 5 – Gordie Champagne and I in our jeep set out to visit our two detached groups. Were bypassed from Pierpoint to Fontaine-Henry on the east, then south to Thaon, south to Cairon, beyond which we cannot go – then north on the main road and visited Capt. 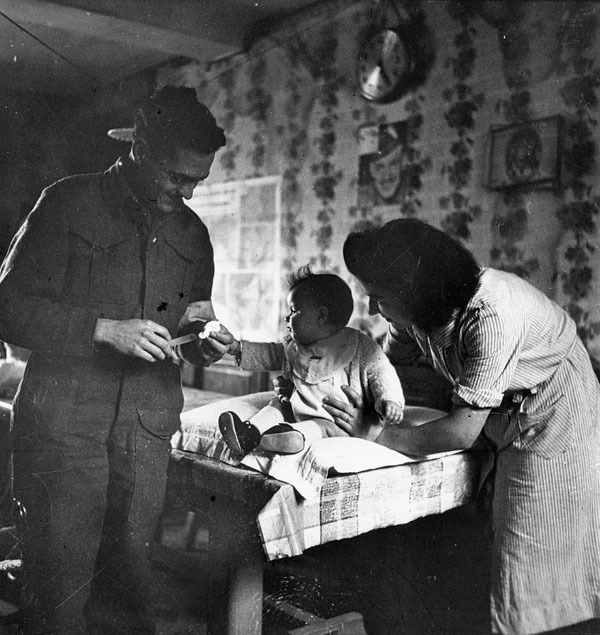 Anderson in his RAP at Camilly, then north to visit Capt. Geggie in his light section set up outside of Le Fresne-Camilly, then back home. This part of the country is becoming very familiar. July 6 – Main H.Q. Corps is landing today. Was up to Le Fresne-Camilly twice today. No new orders for us. The roads today are completely smothered in convoys going both ways. The news is very encouraging and it looks as if something big is about to start pretty. Terrific bombardment tonight. 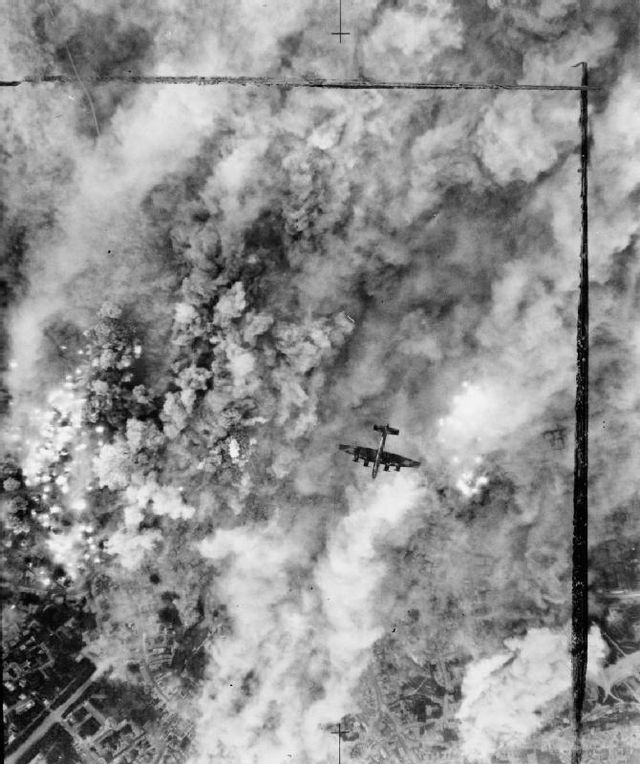 Several small German air raids. just beyond the German Lines. There was a steady roar and the sky was filled with Lancasters and Hurricanes coming back with their protective covering of Spitfires. There were hundreds of planes. One apparently hit by German A.A. blew up almost over us and fell to the earth in flames. At least 5 escaped and parachuted down from here it looked as if they would land in the sea. Just after I had written this, another wave of about the same size came over. 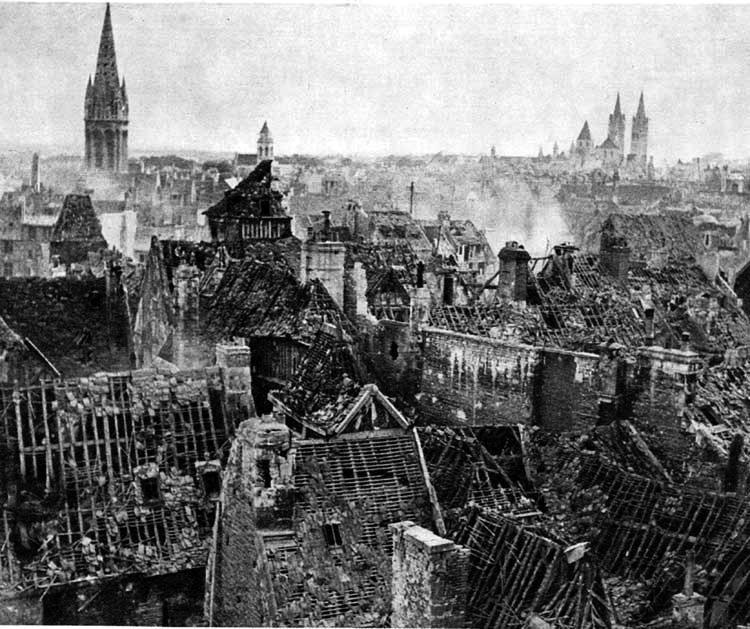 Caen was one objective. We had several German planes over here after dark. June 28 – Capt. McDonald and Champaigne arrived in my jeep and we moved up to area at Amblie about two miles from Reviers. Some of the trucks arrived that night. 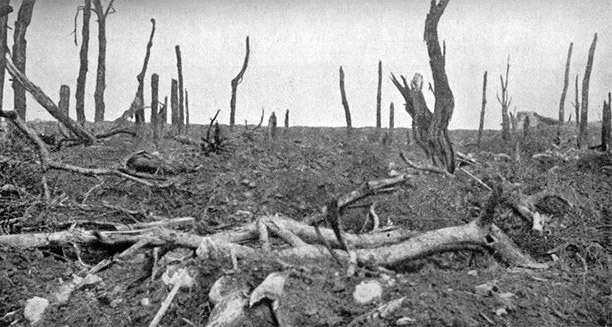 June 29 – At last, all our vehicles are here – we are dispersed around the edges of a field, all camoflaged. The General ordered us to move our tent three times. We are the only Canadian FDS (Field Dressing Station) in France, and the the first Unit of the Second Corps, so are the butts for all the stuff the Generals can think of. June 30 – Rained very heavily last night – very heavy bombardments going in. The boys are busy tearing down and re-erecting trucks. In a few days all will be back to normal again. Last night a horse lay down on my tent and unfortunately I was in the tent. Today we have a barbed wire fence around the tents. Our M.I.R. is the only thing we have open. We will probably sit this way until the rest of the Corps arrives, but it is not a bad place to sit. Jim McKeller is here as Advance Party for 2 CCS. This afternoon I was visited by Brig. Fenwick, Brig. Farmer and Col. Watston and Col. of the 14th Field Amb. We my be setting up in a few days time. An awful lot of air activity today. We are comfortably situated here. July 1/44 – Jim McKeller, a Capt. from Corp H.Q. and myself went forward to the area of Le Fresne-Camilly to recce a harbour for main Corp H.Q. and 6th FDS. The spot chosen is on the main road to Caen about eight miles north west. This afternoon I sent Hans Geggie and his light section as an advance party. We expect to move on Monday July 3rd. We still will not open as a hospital but simply consult. July 2 – Very quiet day today. Lt. Col. Lockhead of the 17th Light Field Amb was over to visit. We are standing to for a move but may not move until day after tomorrow. Beautifuly dinner today of roast beef and green peas. Very heavy bombardment tonight. July 3 – Rain pouring down. Drove out to Light Section, then returned in time for Pay Parade. Maj. Coates of 3rd Div Pay Corps had lunch with us. We are not moving today and still have no definite word about tomorrow. July 4 – Drove out to visit Hans Geggie and his Light Section at Fresne-Camilly this morning. 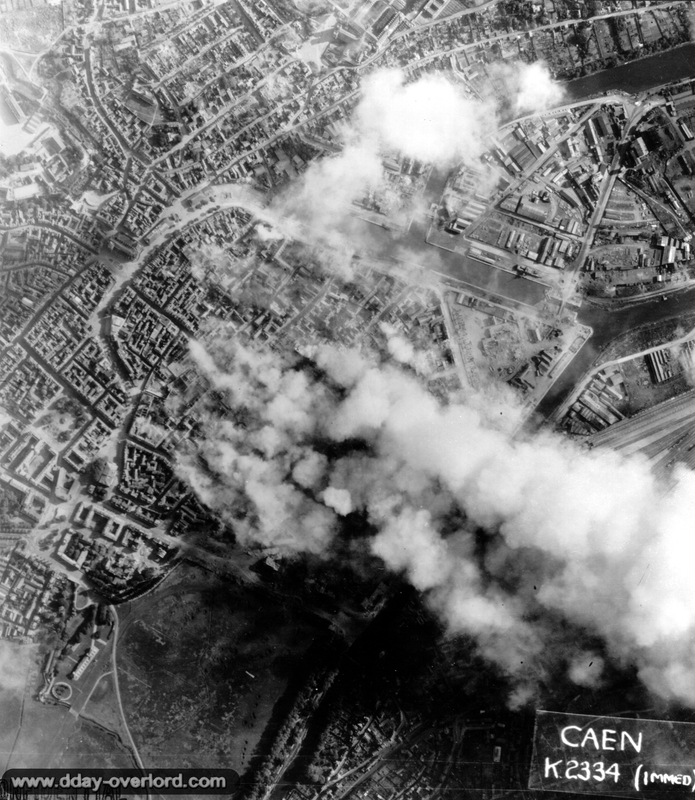 Very heavy bombardment last night and an advance near Caen. Tac. H.Q. moved to Camilly this afternoon – we sent Capt. Anderson, Cpl. Heatley, two men, and ambulance and two 160 lb. tents. We also sent three, 3 ton Lorries to help rations. Will not get my whole Unit together for about one week. June 23 – Large convoy of transports and Tank Landing Craft are leaving tonight. Air raid last night. We sent a case to shore with acute appendicitis. Concert party on board tonight, conducted by Can. Corps H.Q. – assisted by our orchestra. We expect to sail tomorrow night. June 24 – We expected to sail but for some unknown reason a large convoy went out but we remained behind. Gen. Simmons was taken off board tonight, we think he is being flown to Normandy. Concert party tonight. June 25 – Hundreds of planes over today. Church Parade taken by Capt. Walker. No excitement. We expect to sail tonight. 8:05 p.m. – Our men are briefed and we are now pulling out on the Estuary of the Thames. First air attack, but only a fool doodle bug which landed one mile away from us. We expect to enter the Straits of Dover in a couple of hours, so may get a few odd bursts from their long range guns. 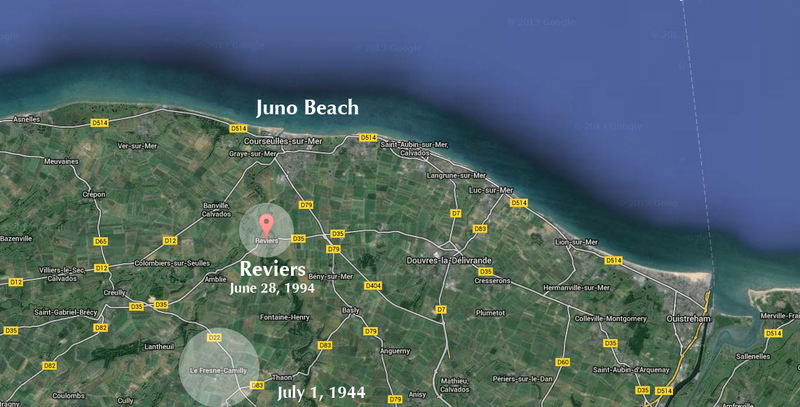 We expect to in about tomorrow night and will land on Juno Beach, just near Baeux. and drop anchor. The sea is alive with ships of all sorts and descriptions. We are remaining on board tonight. The trip over has been entirely uneventful. June 27 – We are putting in towards the Beach – but do not know what our next step is. At 8 p.m. a L.C.T. (Landing Craft Tank) pulled alongside and the marching parties climbed by rope ladder to the deck and pulled into shore. The tide was going out so we could not get right in. Our vehicles waded to shore, assisted by a caterpillar and then we were carried to dry land on the same caterpillars. We landed Graye Sur Mer and marched to the Assembly Areas, then marched to “Ellow” a short distance east of Banville, where we bedded down for the night. 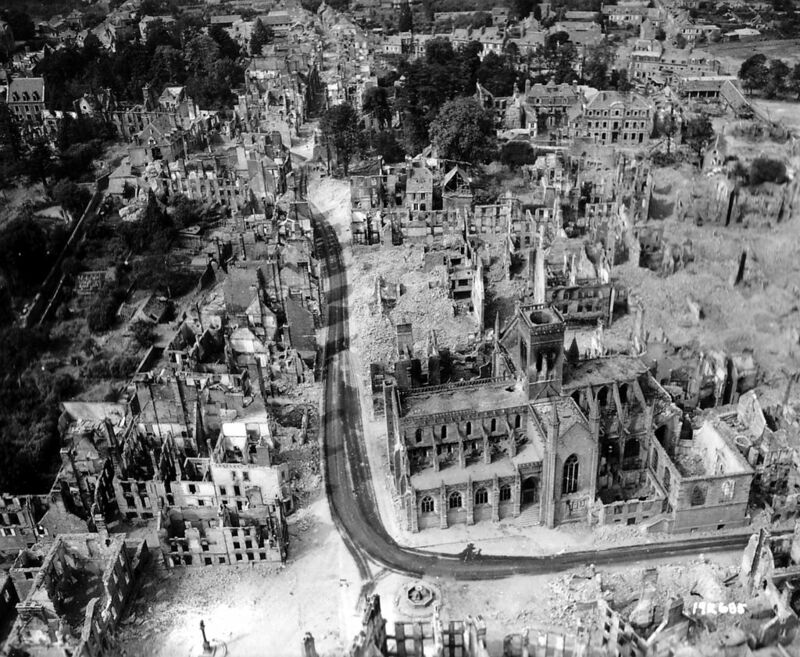 Several air raids during the night, but none near us. Our two ambulances are down the road about one mile. We expect our full convoy along shortly, when we will all proceed to Amblie. June 21 – We are lying in the Thames Estuary with hundreds of other ships, waiting to sail, but as there is a storm in France we cannot land so are waiting here. June 22 – The Manchester Reg. and ourselves put on a combined concert party tonight. We have our Orchestra on board tonight, conducted by Can. Corps H.Q. – assisted by our orchestra. We expect to sail tomorrow night.